Dr Fox provides a simple mechanism for community pharmacies to add an online doctor service to their existing pharmacy website. Prescriptions issued online are dispensed by your pharmacy. Implementation and accounting is straightforward - there are no set-up costs or contracts. UK GMC registered doctors review the consultations and issue the private prescriptions. Pharmacies have a secure (encrypted) log-in area to view and print pending prescriptions for dispensing and despatch. Dr Fox is fully regulated in the UK by the Care Quality Commission and complies with EU and UK legislation. You can offer your website visitors the fully regulated medical services of Dr Fox, generating additional income and loyalty. Registering for the service takes minutes. We require some brief details we can verify to create your account and generate your unique 4-digit referral code. Telephone 0117 205 0198 or email info@doctorfox.co.uk to create your account. Your pharmacy premises and website must be registered with the GPhC, all products must be sourced from reputable UK wholesalers. Please note we facilitate despatch of medicines within the UK only. 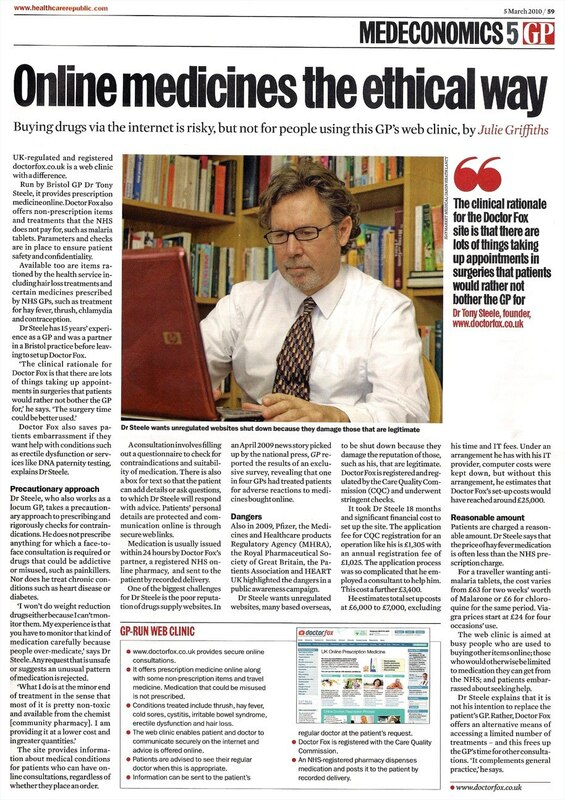 All websites offering medicine for sale must be registered with the MHRA. Items must be posted same or next working day using a Royal Mail signed for service, preferably Tracked 24. Pharmacies must have the capability to operate an effective mail order service. Implementation is a simple process for your website designer/developer. You can place links to consultations wherever you wish on your own HTML pages. These links are direct to any consultation provided by Dr Fox - the links contain an additional tag to identify the referred visitor as belonging to your pharmacy. All link code and full instructions are provided when your account is created. You can literally be up and running within 30 minutes of your account creation. Full support is provided. Live examples available on request. Once a medical questionnaire is completed and paid for by the customer, it will be reviewed by Dr Fox doctors and if suitable a prescription will be issued online. Dr Fox is owned and operated by Index Medical Ltd which is registered with, and regulated by, the Care Quality Commission to provide prescriptions online. Full documentation can be provided to the pharmacy governing the legal and regulatory status of issuing prescriptions online. Pharmacies are given their own secure and encrypted login area to view and print pending prescriptions, and can also be notified by email each time a new prescription is pending. To dispensing the order the Pharmacist simply enters the parcel tracking number, which triggers a notification to the customer that their order has been dispensed. Medications must be despatched by Royal Mail recorded delivery (UK only). Pharmacies invoice Dr Fox, for branded or generic prescribing, the C+D price plus 10% or drug tariff price plus 10%, whichever is lower. Dr Fox pays a minimum £3 where the calculated price (C+D price or drug tariff price plus 10%) is less than £3. P&P charges are also reimbursed (to be discussed). There is an easy-to-use automated invoicing system which will be explained to pharmacies as part of the onboarding process. 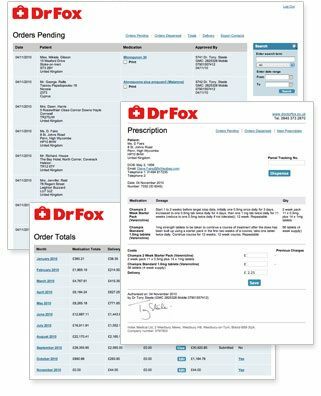 Dr Fox has a proven and easy-to-use area for pharmacies to manage their online prescriptions which includes a monthly accounting and cost submission process. The charge to Dr Fox for the cost of the medications and delivery can be entered for each prescription as they are dispensed, or at a later date. Previous costs for same items are 'remembered' so as to reduce admin in this area. Submitted costs are reviewed and the total paid direct to your bank account within 10 days of receipt. You can place the links to consultations anywhere on your website. We recommend creating separate sections or pages for the service as a whole with explanatory text to inform your customers about the service. Separate pages for conditions or treatments available, with links direct to the relevant consultations are also recommended. Creating your own text will better inform users and may also bring additional traffic from search engines (the more unique text and pages the better!). We also recommend pharmacies utilise their existing contacts by sending a marketing email to their customer database to announce their new service. Dr Fox can provide coded email templates if required. Please do not use 'sitewide' links to Dr Fox pages, as this can cause issues. Telephone 0117 2050198 or email info@doctorfox.co.uk requesting further information or to create your free account. Fast Doctor allows patients to pay for prescriptions online, then collect and pay for medicine at their local pharmacy.